South Australia’s only Disc Golf Park. 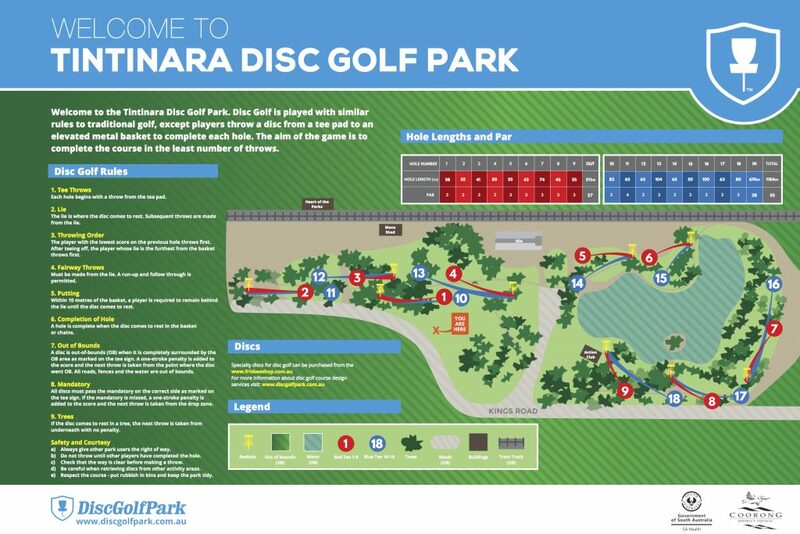 Locate at Lake Indawarra, Tintinara on the main highway linking Adelaide to Melbourne, the Tintinara DiscGolf Park is the first free to play, public disc golf course in South Australia. Disks and Course maps can be obtained through Heart of the Parks. The course itself is 9 baskets and 18 tee positions wrapping their way around the lake and through beautiful trees. The sparking blue lake managed by the members of the local Tintinara Community Members and the whole area has undergone extensive upgrades in recent years. The course installation is an initiative of the OPAL (Obesity Prevention and Lifestyle) program, and the course is popular amongst the local community and visitors travelling through the town.